Mario Balotelli says he does not want to return to Liverpool when his loan spell at AC Milan ends in the summer. The Italy striker, 25, rejoined his former club in August on a season-long deal from the Premier League side. Balotelli has struggled for form and fitness, scoring three goals in 19 appearances, but has impressed in the Rossoneri's past two games. "I want to stay with Milan because I was not happy at Liverpool and don't want to go back," said Balotelli. 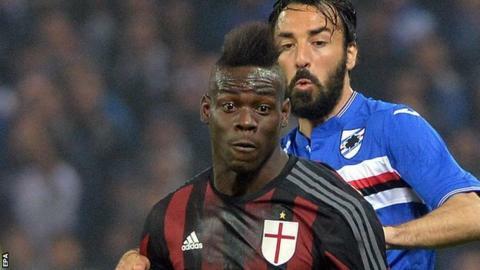 The former Manchester City striker started for sixth-placed Milan in Sunday's 1-0 win at Sampdoria, keeping his place after the 2-1 home defeat by leaders Juventus. "I've played well in my last two games and there are six left for me to prove what I can do," he added. Balotelli scored only one Premier League goal for Liverpool following his £16m move from Milan in August 2014.